Dua Lipa, (the remarkably beautiful YouTube star gone pro) not only has a great voice but she has lusty lips and legs that won't quit. For now she's quite slim but great curve potential. 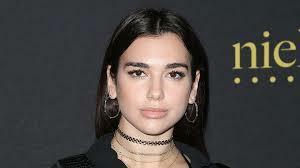 I predict a thicker Dua Lipa a few years down the road. Last time S77 predicted that a woman gonna turn fat, most everybody didn't believe him. One and half year later, the then-trim British lady in question turned to become the top tier star of this website. Please don't quote all the pics, thank you. I've long wished for the ability to spot latent feedees. I'm skeptical as to whether S77 has it, but if he does I'm envious!